Flawless Victory over Lahore, greatest tank battle at Chawinda, M.M. Alam’s 5 kills in one minute, Major Aziz Bhatti, and Nishan e Haider; 1965 war is all about tales of bravery. The spirit of 1965 war of India and Pakistan is still alive. It has been more than half of the century since the 1965 war happened, but the memories of bravery and courage of Pakistan army and nation is still cherished in hearts. 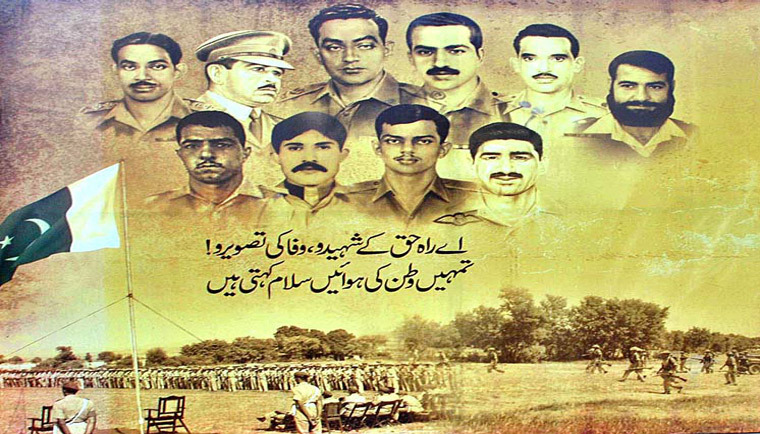 Every battlefield of 1965 war is shining bright with the stories of bravery, courage, valor, and patriotism. Pakistan army stood like a solid wall against enemy to defend their homeland. Melodious voice of Madam Noor Jahan, and Mehdi Hasan gave more courage to the fighting soldiers and helped in boosting their moral. Brave people of Lahore used to stand on their roof top to witness the passing fighter jets of Indian and Pakistan air forces. In 1965 Indo-Pak war, Pakistan had limited stock of ammunition and weapons as compared to the Indian army, but the gallant and bravery of Pakistani soldiers was much higher to eradicate this difference. Whether its Khem Karan, Chawinda, Chamb, or Wagah border, Pakistani army defended their homeland on every battlefield and defeated the enemy. During this 17 days 1965 war, Pakistan was able to occupy 1617 square miles area of India. 1039 Pakistanis were martyred during 1965 war. However, around 9500 Indians were killed during 1965 war. In 1965 war, Pakistan’s 14 aircrafts, 165 tanks were destroyed, whereas, India lost 110 aircrafts, 475 tanks in the battle. Due to this heavy loss in September 1965 war, India contacted the United Nations council to intervene and end this war. Defence Day of Pakistan brings back the golden memories when motherland was defended against the four times bigger enemy. Let’s pledge to support our brave army and take measures to defend every inch of our homeland. AMEEN.